Artechoke Media is run by two marketing professionals. We love jiu-jitsu, and we have used our full-time jobs as marketing consultants to bootstrap our beloved publishing start-up. Since Artechoke is starting to takeoff, we thought it might be helpful to apply our marketing experience to jiu-jitsu, especially if it means helping instructors to connect with potential students and grow the sport. In our work with instructors, we have seen that one simple misstep holds many gyms back: they are slow to respond inquiries. This seems like a small detail, but waiting too long to reply to an email or to listen to a voice mail can mean losing what could have been your best student. Watch the video below to learn more. What does it mean to love a grappler? For the people in our live, jiu-jitsu is can be an odd gorilla in the room. Jiu-jitsu can be a source of joy, motivation, and inspiration, but it can also be a source of pain, frustration, and anger. Our sport is a challenging one full of highs and lows. It’s demanding, time-consuming, and ever-present. So if you love someone who loves jiu-jitsu, it’s almost like being in a relationship with the individual that you care about and with jiu-jitsu by proxy. To help families and friends navigate these waters, Valerie Worthington, one of the visionaries behind Groundswell Grappling Concepts–alongside the likes of Emily Kwok, Hanatte Staack, and Lola Newsom–wrote a lighthearted guide. Worthington’s book at once serves a primer on the sport and what it entails and as a self-help book of sorts, offering advice and considerations for parties on either side of the jiu-jitsu line. Worthington’s open and conversational style helps to demystify the love for jiu-jitsu and to foster conversation. The goal of the book is not to convince non-grapplers to love everything about jiu-jitsu. Instead, the goal is to get both sides to come to a better understanding of each other to make jiu-jitsu a source of positivity. 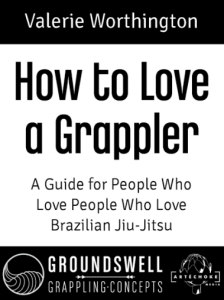 Download How to Love a Grappler today! Digital rights management is important to us not just because it has informed the design of our cloud instructionals. We’ve seen the desire to guard information from theft on the mats as well, and we are worried that it could hold the sport back. 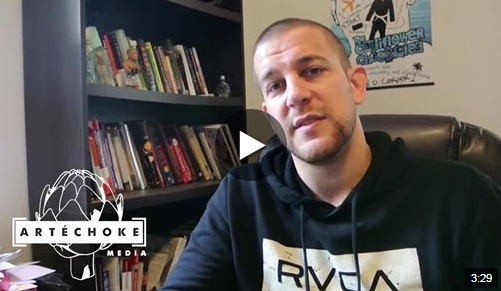 Check out the video below to learn more, and stay tuned for more video blogs from Artechoke Media. White belts are a strange breed. They come onto the mat with a Frankenstein monster of an idea of what training should be, fashioned from Ultimate Fighter highlights and YouTube videos and Kung Fu flicks. White belts ask odd questions, and they make unusual mistakes in decorum, etiquette, and technique. But we love them. White belts are the future of the sport, and we believe in supporting their growth and doing whatever we can to make the sport more accessible for white belts everywhere. Enter White Belt Problems, a new multi-faceted jiu-jitsu resource. White Belt Problems is the brainchild of Matt “Aesopian” Kirtley. He wanted to build the ultimate guide for new students, answering every question that forum veterans have seen and answered hundreds of times. In one swoop, White Belt Problems aimed to improve the retention rate for new students while also freeing up forums to spend more time discussing higher level topics. As it stands now, White Belt Problems answers the vast majority of typical white belt questions, but the sport grows every day, and we recognized that our perspectives are not the end-all. So we made White Belt Problems open source. Anyone can ask questions, and anyone can respond to questions, new or old, creating the potential for an evolving, comprehensive resource. 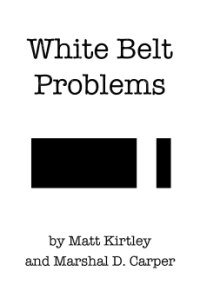 White Belt Problems exists as a free to use website and also as a print book. As White Belt Problems grows, we have plans of releasing new additions to reflect these new insights. Beyond our belief that knowledge should be preserved (one of the reasons why our cloud instructionals are also available as DRM-free downloads), we recognize that paper books are sometimes easier to share. You can give White Belt Problems to a friend, keep it in your gym bag to share, or buy in bulk (contact us for wholesale prices) to distribute to new students when they sign up. In our mind, White Belt Problems is another step forward in our mission to promote the organic growth of jiu-jitsu, but it needs your support to truly make a difference. Thank you for sharing and contributing to this new resource. Read White Belt Problems today. 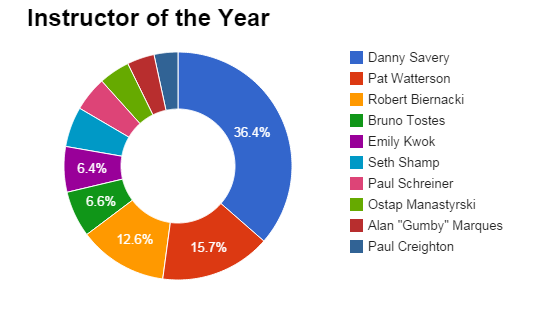 Danny Savery is the 2014 Instructor of the Year! Selected by number of nominations. Click here to view Danny’s YouTube channel. Danny continues to excel in the art of jiu jitsu and provides high quality instruction on a daily basis. He is a man who many individuals like myself look up to and can rely on not just for technique, but also for everyday life. He is very caring to each and every student and meets everyones individual needs. The continued dedication and hard work that instructor Danny displays is not matched by any individual I know. 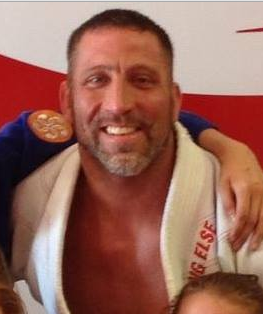 -Brian M.
Instructor Savery is very knowledgeable in the sport of Jiu-Jitsu. He is an amazing mentor, and makes it easy to learn most techniques with little difficulty. His way of teaching makes it hard to go to other instructor’s videos and learn from them. -Daniel Ares Savery Jr.
We were excited to the range of nominated instructors and the support that they inspired in students. We had local newspapers cover finalists. Students set up Facebook ads to raise awareness for their instructors. And Redditors continued to talk about other instructors that were exceptional even though they missed the nomination deadline. Stay tuned for an interview with Danny Savery, courtesy of Open Mat Radio. We’re looking forward to hearing about his teaching philosophy and his approach to running a BJJ academy. Thank you to everyone for supporting this campaign. Please visit our contest partners Open Mat Radio, a great jiu-jitsu podcast, and r/BJJ, a rising star in the BJJ internet community scene.